The EVH Frankenstein does a great job of creating early Van Halen guitar tones and more. I’ve tried a number of pickups in my newly finished Strat over the past few months. I recently traded some pickups for an EVH Frankenstein Humbucker and thought that my Frankie-inspired strat would be the perfect test bed for this pickup. Sure, it has an alder body, custom brass and titanium vintage style bridge and stainless steel frets, but the vibe was there for the EVH Frankenstein to fit right in. As usual I tested the EVH Frankenstein Humbucker through my Blackstar HT-5 head and Celestion Vintage 30 1×12″cabinet. The EVH Frankenstein Humbucker is an interesting pickup. It was designed with Eddie Van Halen’s input by Seymour Duncan to go in the $25,000 Frankenstrat tribute. The Frankenstein Humbucker isn’t an exact replica of the famous pickup, but rather something that gets the sorts of tones that it is capable of. With a degaussed (aged/weakened) Alnico 2 magnet and a 14.4K resistance the Frankenstein has a real hot overwound vintage PAF vibe. It has a vintage single conductor braided ground wire, so there’s only one way you are going to wire this up – full bore humbucker baby! In style with the original it’s acting as, the Frankenstein is only available in classic Gibson pole piece spacing. That really isn’t an issue, other than cosmetically. There’s no cloth tape covering the wire coils either, its really made to look like the old humbucker Eddie pulled out of a Gibson and removed the pickup cover. Starting off on the dirty channel of my Blackstar HT-5 I was greeted by a some great tone. The Frankenstein is tonally very balanced with a nice muscular low mid crunch. The degaussed Alnico 2 magnet gives you a very chewy low end that is great for big rock chords, and single notes squeeze out of the guitar in a really good way. Lead guitar parts sound amazing with the Frankenstein. The tone isn’t too thick that it’s too muddy down low, and it isn’t too thin that things sound shrill up high. 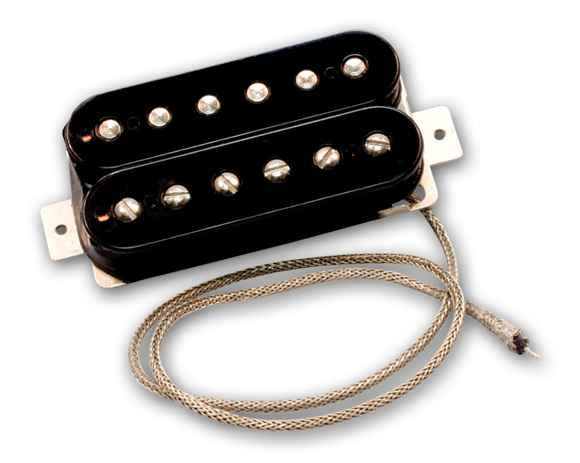 Harmonics, both natural and artificial pop out of this pickup with ease. Many will want the Frankenstein to cop early Van Halen tones, and with the right amp and settings this pickup will get you in the ballpark. No one is going to sound just like Eddie, even with the same amplifier, effects and guitar, but this pickup at least gives you the vibe from those iconic first few albums. Don’t discount the Frankenstein as a one trick rock pony though. The chewiness of the tone won’t exactly give you the sharp precise attack required for modern metal, but it is more than adequate for traditional heavy metal, as well as doom, sludge, punk and stoner rock. The Frankenstein’s cleans aren’t the cleanest with the guitar’s volume full tilt on a clean channel, but it does have a nice gritty quality. It gets much nicer when you roll it back. In fact with the guitar’s volume knob rolled back a little you get a really sweet tone, thanks to the Alnico 2 magnet. Playing through a cranked single channel amp and riding the guitar’s volume control like Eddie yields great results. The Frankenstein will give you a really sweet tone with a slightly gritty texture when the volume’s rolled back, just like you hear on those early Van Halen albums, and spin around to great cranked dirty tones with it on ten. Overall the EVH Frankenstein Humbucker is a fantastic pickup that really gets that early Eddie Van Halen vibe to a tee. But not only that, It’s a great pickup for any rock and more. As far as pickups go it’s pretty expensive, but its certainly not overrated. If you think that the Frankenstein may provide the sort of tones you seek, and have the funds for it definitely try one out. 11 Responses to "EVH Frankenstein Humbucker – review"
How does it sound say compare to a TZ? What is your take on the 2? Hit some key’s for me phantom, I have been waiting for your take between the two and what ever else you what to throw in out about it or other Pup’s? Thanks for your input as alway’s! Well the resistance figures between the two isn’t too different, so the compression of them are fairly similar. The Frankie’s Alnico 2 magnet gives it a spongier, chewier low end, where as the Tone Zone’s Alnico 5 is a bit stiffer. The Tone Zone is higher output too, but not greatly so. The low end is bigger and the treble is lower compared to the Frankie. That makes me think more and more of a Aired TZ maybe with maybe a little less highs or about the same? Airing it probably won’t affect the highs that much. I’m sure I’ve got some samples from a while back in my Taming the Tone Zone posts. Check them out. If you’ve already got a guitar with a Tone Zone I’d go with the Frankie if you have the money for one new or used. If you want different colours maybe try some bobbin toppers from eBay. The standard spacing isn’t really an issue tonally or volume wise. But then again I like having having pickups in different guitars to give me different tones. Trust me that is what I am thinking, I like the TZ in my basswood Charvel. But I may take it out and put it in my Alder Strat. Then put the Frank in the Charvel. It’s all kind of confusing but fun! I do thank you for sharing with me and the web your finds! This is a great guitar pickup I used it in a couple of guitar I own. It gets the greatest sound and exact sound I want. Thanks for sharing the review! Rather late to the party, but I have a question about the EVH Frankenstein pickup which has been nagging away lately and I would appreciate some knowledgeable input. I’d agree with what you have to say above about tone, especially for chords, but my issue with this pickup is the slight – but still problematic – lack of sustain when soloing. It just isn’t powerful enough. Or perhaps the one I have is faulty. This is what I am trying to puzzle out. I tested resistance on the pickup output cable and got a reading of ~11k, not the specified 14.4k. Wiring is correct, clean and minimal, direct to an EVH 500k pot then to the jack socket. No shorts; no dry solders. Pickup height is ~3mm below bottom E / 2mm below top E (string fretted at 21st fret). Direct mount to the wood (poplar Kramer Pacer-type body). I have tried shims under the mounting feet but even at ~2mm / 1mm the sustain wasn’t there. When I compare the tone to an EVH striped series with a Wolfgang, the Wolfgang delivers substantially more sustain and is much more playable as a result. The Wolfgang is also *very* bright in comparison, and positively bristles with harmonics. The Frankenstein is duller, less dynamic and noticeably less powerful. In fact I’ve had to resort to using an MXR Micro Amp with the Frankenstein to nudge it up to where I want it to be. When boosted, it sounds reasonable, but should I be having to boost a 14.4k pickup? My instinct is that something isn’t as it should be. Does this sound like the Frankenstein you reviewed? I don’t remember it particularly lacking in sustain. 1K is definitely on the lower end of the acceptable range. Have you definitely tried re-soldering just in case something is not quite up to snuff? I know I’ve had something that looks properly soldered and it hasn’t sound right in the past, and a re-soldering fixed it up. Great blog. Lots of good info here. Closure, at last. I should have posted this long ago (18 months), but better late than never – and for the record. The problem was in the jack socket, not the pickup and not the wiring. So it got missed by re-soldering. A lesson learned there. It’s a good pickup. Through Line 6 HD I get as close as I’m ever likely to get to VH1 tone and stepping out of that circle, lots of nice hot-vintage tones. So definitely one I would recommend if you think that the ‘super distortion’ school of humbuckers is throwing the baby out with the bathwater.